Our April Alchemy fabric selection is Gelato from Maywood Studios. This fabric is a beautiful ombre that transitions from dark to light to dark, from selvage to selvage, with tone on tone lines. Photos can't do it justice. The rich colors and visual texture make this fabric the perfect blender, but it can also be the star of the show. We paired Gelato with Kona Cotton in black and white for this Polanco quilt. This pattern puts the focus on the color and how it transitions. Stunning! This pattern really shines a light on the ombre effect in the fabric. You can achieve the same effect, with other strip friendly patterns like Birch Bark or Flora. Patterns like Cranberry Chutney and Preppy Pod, that have large pieces of fabric would also be a good choice to showcase the ombre colors. Want to show off the ombre without committing to an entire quilt? Try a fat quarter apron. You can also fussy cut Gelato to feature the exact color, or blend, you want. Prefect for quilts like Arctic Feathers or Himalyan Pink. Add some of this months companion fabrics and you'll have a great mix to work with for either quilt. Looking for just the right smaller project to show off your fabric? What about a Lisa the Unicorn pillow? That mane would be fantastic in Gelato. An adorable animal stuffie? Any little one would be thrilled to have one of their own to cuddle. Try Pincushion Party from Jen Kingwell Collective. The four sizes and 15 appliqué designs are ideal for experimenting with color, or getting a quick sewing fix. Plus they are darn cute! Whatever you choose to do, don't forget to share it with us. Use #stitchinpost on Instagram or tag stitchinpostor on Facebook. Putting on my explorer hat in this new calendar year I wanted to challenge myself to work in a color palette that was completely new to me. I chose blue and orange, which are opposite each other on a standard color wheel. I always begin by pulling as many fabrics as I can that “might work” in the composition. Log cabin style blocks are my very favorite and allow the use of a variety of fabrics with a mix of solids and prints. My first block ended up more blue than orange, and you can certainly see the variety in the different oranges. As I worked it became evident that one of the colors needed to be dominant, there was a bit of a struggle for a time. Because of the strong contrast, each wants to dominate or be most important. Once I had a few blocks made I wanted to start designing the quilt. Using a piece of foam core board, with the background fabric I had chosen pinned to it, helped me to see how the blocks might play together. I struggled with rearranging for a while, and realized that most of the blues were flat or dull. I looked for a brighter blue that was more intense and it certainly added interest. At the same time, I came across a red orange that I didn't use and added small bits of it, like little brush strokes. I think I am ready to sew it together. This was a good exercise for me. Below you can see a small piece I made featuring yellow and purple, opposites once again. This was another experiment and I found out how very strong the yellows were that I choose to work with. This is a totem style composition and works well for putting smaller, experimental blocks together. “Hidden Stone” began as a red quilt. I pushed the color red, to red violet and to red orange. An ancient rock wall was my inspiration for the shapes and once the quilt was finished it looked better on its side. While working on it, it was feeling a bit boring, so I snuck in some acid green and for me it felt more complete. In "Landscape" you see a mostly green quilt with just a touch of red. An idea for you is to audition a color palette by making a small log cabin block, or two, experimenting with the fabrics to see how they play together. To construct the pincushion, I free-cut the strips to fit as I add them around the center unit. I do not use a ruler, but trim and angle shapes as I work. I do plan the end size for the block, and keep adding strips in a variety of widths until I reach that number. I find that I feel more and more creative as I go and start seeing some results. I like to fill the pin cushions with crushed walnuts. They keep the pins sharp. March's Alchemy of Fabric collection combines bold colors and geometric patterns. The addition of orange and black freshen up the classic red, yellow, and navy color scheme and give the collection a modern feel. The ten companion fabrics draw from the same colors while introducing more pattern and scale to the mix. The lovely and skilled Fern will be making all our Alchemy of Fabric projects from now on. This month, she chose to use her fat quarters to make two pillows, focusing on the yellow, white and navy fabrics. The first pillow is pillow #6 from Val's pattern Jewels for the Home . The finished pillow is 18" x 18" and features an adorable bird applique. Fern used the Navy Metsa Saihke for the front, Sunshine Herringbone for the bird and half the back, and the white woven for the remainder of the back. The hand-stitched feet on the bird add a lot of character to the pillow. The second pillow was pieced to use the remaining navy, sunshine, and white fabrics with a black Metsa Saihke back. Fern did a fantastic job fussy cutting the navy to feature the diamond design. She also added interest to this pillow by altering the direction of the herringbone print. The pillows look so fresh and springlike, it's hard to imagine that we are still struggling through multiple feet of snow! Please post your project to Facebook or Instagram with the tag #alchemyoffabric or #stitchinpost, we'd love to see them. In Wonky Four Patch - Part 1 we talked about color mixing and grouping your fabrics. This post will cover block construction, part three will cover completing the quilt top and we will end the series with my attempts to long arm quilt for the first time. First, take a look at the completed quilt top. If you look closely you'll see that the top is composed of 35 four patch blocks in a 5 x 7 arrangement. Each block consists of four sections, each from a different fabric, and looks something like the one below. If you followed along with the first post your 10" squares will already be in nine groups of four. If not, pause here and organize your fabric. Follow all the next steps for each group. 1) Stack one group (all four fabrics), lining up edges as closely as possible. 2) Cut stacked squares once vertically and once horizontally (as shown below). Cuts can be straight or angled in either direction. All cuts should be a minimum of two inches from any corner (to prevent bulk and keep pieces close in size). Vary the position of cuts for each set of four fabrics. 3) Arrange your fabric so each layer of your stack has one section of each fabric (as shown below). Karla Alexander calls this technique "stack & shuffle". Transport your stack to your sewing area. It's finally time to sew! I like to cut, and then immediately sew, each set of four blocks to limit my chances of confusion. I found chain piecing helped me keep all my sections in order and eliminated a lot of time starting and stopping. If you are wondering about the blue tape on my sewing table... I use a ruler, with the needle lightly touching the 1/4 inch mark, to position the tape. Having a long line to position my fabric edge against helps me keep my seams consistent, accurate, and straight. Using a quarter inch seam, piece the top two sections of the top block together, then the bottom two sections. Continue sewing the remaining blocks in the same manner. You will end up with a string of eight sections (see above). Notice the colored pins in the photo, I add matching pins to both sections of a block as I sew. The pins ensure that I can pair my sections easily after I've clipped my chain apart. Press your sections in their block pairs, pressing seams in opposite directions. Most of your sections will not have a clean straight center edge to sew (see below). No worries, just trim the center edges of all sections straight. In other words, trim the edge where you will sew the two parts of your block together (see below). Next, place top and bottom block sections, right sides together, with seams aligned. Your center edge will not line up yet. Measure a quarter inch from the edge to be sewn (center edge) and place a pin straight through both seams (see below). Gently rotate the top section until center edge is lined up, being careful not to shift seam placement. I like to work on my ironing board so I can push the pin through the fabric and into the board to ensure my seams stay exactly where I want them while I line up the center edges. Sew the block sections together. Press (seams can go in either direction). Trim your finished block to 9" square. Repeat until all blocks are completed. If you'd like to quilt-a-long with me, or try this project on your own, we have a number of fun 10" square bundles in stock. From top left - Pirate's Life, Grunge Basics, Woodland Secrets, Marmalade Dreams, Betty's Luncheonette, and Kaffe Fassett Collective Fall 2018 in Night. As always, please send me your photos or post them on social media with #stitchinpost if you try this project. "Something like," because obviously my quilt is still in progress, and because this project is designed to be random and unique. All my four patch blocks are done, but I'm still moving them around on my design board to find the composition I like best. Now that you have an idea of our final look, let's go a few steps back and talk about how I selected the colors for my block groups. To make the blocks for this quilt you need to divide the squares into groups of four (each group will make 4 blocks). My package came with 42 squares, so I could make up to 10 groups of four. I decided I wanted my quilt to be 5 x 7 blocks or 6 x 6 blocks, which means I need nine groups of four (36 sqs total). Ok, task number one is to eliminate six squares. I selected 36 squares, then folded them in quarters and laid them out side by side. Anything stand out? Yes! The white immediately draws your eye, and not in a good way. For this quilt I wanted a harmonious mix, and not a focus color. The white has to go. Besides eyeballing it, try taking a photo in both color and black and white. You will see things differently. The white is even more obvious in the black and white photo. Take two - I replaced the white with lavender and the pink with yellow. I think the pink worked ok in the mix above, I just have personal issues with light pink and wanted to bring in the purple so the dark purple had a light companion. This time I didn't like the yellow and replaced it with a second lavender square. Much better. In the end, I eliminated two white, two yellow, and two pink squares. Next, I divided my colors into warm vs cool, and then split the warm and cool groups into light and dark halves. You will have to imagine the lavender in place of the pink and white. I forgot to retake the photo after I finished playing with my colors. I'm sure you get the idea anyway. At this point there are four groups of nine squares, but we want nine groups of four. To make my final groups I pulled one piece from each group. Taking the time to divide your fabrics into four groups and then building your sets helps ensure there is balanced color distribution and contrast in every block and across the entire quilt top. I set myself a few other guidelines for selection my groups. Each group of four should have no more than one neutral color (creams, browns, greys & black) and the remaining three colors selected should include as many varied colors as possible. In other words chose a neutral and try not to select three blues in the same set. Here are the groups I came up with. You won't be able to keep to all the guidelines/rules in every group (there is a lot of blue and orange), but the more you can, the more unified the finished quilt top will look. In the example group below I have two blues, but I tried to keep them as different as possible by selecting one dark blue and one lighter and brighter blue. You can apply the same principles to other groups of fabric, or try dividing your fabric by color family, print size, value, or whatever else strikes your fancy. Just shoot for even distribution of color/print across the quilt top and enough contrast in the blocks to see each section clearly. Here's an example with prints from the Garden Delights bundle. With this fabric I first spilt the pack into color groups: red and purple or blue and green. Then I split each color group into a light and dark group. I also tried making four color groups, but found there wasn't enough contrast. A completely different look from the Grunge collection, but equally pretty. Next post we will go over how to construct your wonky four patch blocks and put them together. No pattern required! Charley Harper is one of my all time favorite artists. Imagine my excitement when I discovered an entire line of Charley Harper fabric had arrived. Happy dance doesn't not even being to cover it. I immediately knew I had to do something that showcased Charley Harper's amazing talent, and showed this beautiful fabric at it's best. Valori's pattern, Rosalie, fit the bill perfectly. Large hexagons to display the prints, and strong graphic lines to compliment the art style. The table runner is one quilt row using the larger size templates with a one inch border (finished size) added to each long side. I have a long table, so my runner has seven hexagons. You can easily change the length to fit your table, by changing the number of hexagons. Construction is simple (no Y seams!) and I was able to put mine together over a weekend. I love how it turned out and can't wait to have it on my table. The pattern includes templates for the hexagons & triangles that make up the body of the quilt. I want to show you how to accurately copy and use the templates... First, gather your supplies. You'll need template plastic, a fine tip Sharpie (or other permanent marker), a ruler, and some painter's tape. Place the template plastic over the pattern template and secure with tape. Make sure you tape the template plastic to both your work surface and the pattern. Then using your ruler and Sharpie trace the template. Remove the tape and rotate the template plastic 180 degrees. Line up your template with the dotted line on the pattern template (see above). Secure with tape, and trace. Using your ruler add a vertical line (not on the pattern template) so your template lines cross in the center. This will help you line up your template with your fabric, and center it, when it comes time to cut. You can cut your template out with scissors, but I find you get more accurate, and straight, cuts with a rotary cutter. However, don't use your fabric blade/cutter on the template plastic. I keep two sets of rotary cutters in my workroom, one for fabric and one for other items. Beside working wonderfully with template plastic, I use my non-fabric cutter for wrapping paper, ribbon with wire, freezer paper, card stock, poster board, etc... Don't forget to label your cutter so you don't mix them up! Now that your template is ready it's time to cut out your hexagons. Template plastic is translucent so it is easy to use the center lines to place your template, and ensure the print is straight and features the elements you want. In this case, I used my template's vertical line and matched it to the bird legs (see above). With such strong lines in the fabric pattern it would be very noticeable if it was cut askew. When cutting your fabric with a plastic template use a quilting ruler along the edge. Template plastic is meant to be a guide not a surface to cut against. I make my first cut, then secure the template and fabric with a bit of tape to ensure an accurate cut. Taking time with your template and cutting will make your sewing a joy and improve your results. Once my row was complete, I added a one inch (finished size) boarder to each side. Instead of binding the sides, I made my quilt sandwich then sewed a quarter inch seam down both long sides. I turned my seamed sandwich right sides out, pressed it, and added binding to both ends. We have all the Charley Harper fabrics used in the runner, and the rest of the collection, in stock. As always send us your pics or bring in your finished projects. We love to see them! If you post your project on social media be sure to tag us with #stitchinpost or #sewmuchinspiration. Hello! Happy New Year! I hope everyone has recovered from the holidays and is back to sewing. We are on the final stretch of the Marmalade Dreams quilt. You have made all your parts and it is time to sew together the top. Follow the diagram in the picture below or your pattern. Now this beautiful top is ready to quilt. I thought I would share my quilting to get you going on ideas. There is such high contrast from the background greys and neutrals, to the colorful blocks so I picked a neutral thread that would look good on both. When I am choosing thread I like to pull the end of the thread from the spool and lay it across the quilt top. It gives me a better idea of how it will look when quilted. Just laying the spool on top of the quilt top doesn’t give me the same perspective of a single strand. For the large log cabin blocks I decided to quilt lines in the small colored areas and my style of meandering in the neutral logs, continuing the design throughout all of the light backgrounds. Even for the little log cabins I did lines in the colored logs. The diamonds I wanted to keep simple and not take away from the prints or the piecing. I quilted a curvy diamond shape in all of the diamond sections. I am not one who likes using rules, or my walking foot, so these are free form. If you want them perfect I would use a ruler or a walking food depending on what type of machine you are using. My meandering quilting is a flowing designs that intertwines with itself, lots of swirls, flower and leaf like shapes. I hopefully this will give you some ideas for quilting your own Marmalade Dreams Quilt. Lastly I have included the final recipe…. I had to laugh because it is snowing outside and the recipe is for Summer Berries. You can make this with frozen berries. Enjoy! Thank you for being a part of Marmalade Dreams Block of the Month. I would love to see any finished quilts! Have a great day! So many amazing and inspiring teachers visit Stitchin' Post and we thought you would like to get to know them a bit better. and Muskrat Hollow Precision Piecing this April. You can also find out more about Shelley and Bernie on their website. To start things off I must apologize for the delay in getting part 4 of our Marmalade Dreams QAL out. We are diving into the last pieced section before final assembly of your quilt. To start this section, you will be using the C and D Templates which are a smaller version of the A and B templates. Once the pieces are cut out arrange them on a flat surface. Then begin stitching the shapes together in horizontal rows pressing the seams open or in one direction…I find pressing seams open creates a flatter piece and the rows are easier to stitch together. Once the rows are finished, then join one row to the next pressing after each seam. To finish Part Four, stitch the filler side strips together and press the seams. Join to each side of the panel. Always refer to Figure 10 while you are in the process of creating these two units. The diamond shapes are not a mirror image of each other, but the filler strips are. In a few weeks we will put all the parts together. 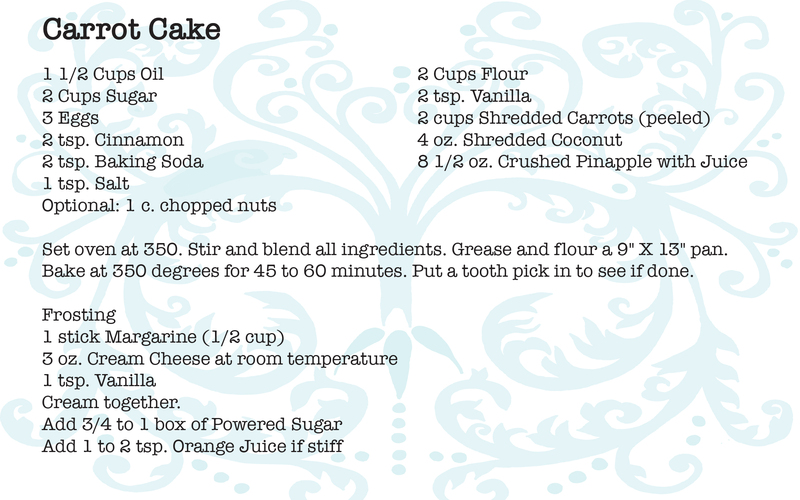 Now onto something yummy….. My mother has been making this carrot cake for many, many years and it is always a big hit. The addition of coconut and crushed pineapple add moisture and flavor. We do leave the nuts out. And the frosting is amazing! Like everyone else my thoughts are starting to turn toward the holidays and entertaining. With that in mind, I choose the Pearl District table runner pattern by Busy Bee Quilt Designs for the pick of the month. It's a great pattern with instructions to hand applique, machine applique, or fusible web the circles to your squares. Jean made this table runner back in June with Chalk & Charcoal charm packs. So sophisticated! The quilting adds so much interest to this project. Take a look at our earlier post, for more project details and a hand applique tutorial. Materials : 1 Chalk & Charcoal complete collection charm pack,1 Chalk & Charcoal assorted basics charm pack and 1 7/8 yard black quilting cotton for border and backing (Kona black is a good choice). I digitally put together a few more options to consider. Digital representations are created from photos of the fabric. Fabric scale, repeat, and color may be altered. Pictures are meant to give you an idea of what the project will look like, not a prefect representation. First up, I selected 101 Maple Street charm packs. I love the classic appeal of this collection. It reminds me of arts & crafts design, and I thought it was perfect for fall, without hitting you over the head with a theme. I think it came together nicely with the dark border, but any fabric from the collection could work. Materials : 2 101 Maple Street charm packs, 1 7/8 yard Maple Syrup Deep Dish Dots for border and backing. Paige, our graphics guru, selected a joyful Christmas mix for her version. Paige's version used three fat quarter 6 packs. The pattern calls for 18 different fat eights, or fat quarters, making it a perfect project for fat quarter bundles or towers. If you go with fat quarters, you'll have enough fabric to make two table runners, or a lap quilt. Be sure to get more backing and border fabric though. Materials: 1 Red Holiday 6 pack, 1 Green Holiday 6 pack, 1 Holiday Lights 6 pack, 1 7/8 yard Way Up North for border and backing. These two prints from the Way Up North collection are also good options for your border and backing. Our last table runner features fabrics from White Christmas by Zen Chic. Karen, one of the lovely ladies on the shop floor, chose and is actually making two runners in this combo to give as gifts. Materials: 1 Zen Chic 6 pack Cream, 1 Zen Chic 6 pack Light Grey, 1 Zen Chic 6 pack Black, 1 7/8 yard Quilter's Linen Crimson. If you prefer something a bit more understated you could add a solid black or any of the fabrics from the White Christmas line. I also thought Hudson-Field from Camelot Fabrics would make a nice border and backing fabric with it's small red accent. Pearl District is a wonderful pattern and I hope you're inspired to try out one of our versions or come up with your own. Please share photos with us if you do. I love seeing all the creative ideas and talent our customers have!